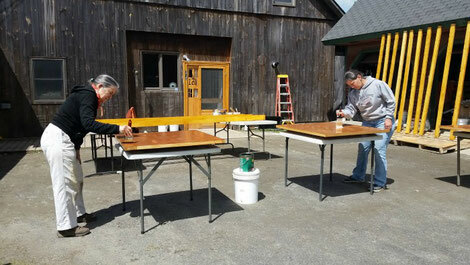 A group of Great River Co-op Member Volunteers had a great time recently putting in some hours sanding and staining boards that will soon become picnic tables for Orchard Hill Breadworks. Prepping the boards was one of many projects to be completed before their summer-long series of Pizza Nights-weekly community events offering up delicious pizzas, great company and local music with 100% of the profits going to area causes. On August 1st, the Co-op will benefit from one of these events (Read all about our Pizza Night in our last blog post) And we were happy to step up and help out! Thanks again to Noah at Orchard Hill Breadworks for including us in such a fun summertime tradition! We can't WAIT for our event, and we'll be there supporting the other causes throughout the summer as well.